Previous Post: Where to Camp? The Wooden 2-by-4 dome starts life as several pentagonal subassemblies. These will tilt up to form walls. A temporary metal brace stabilizes each pentagon, preventing folding as the pentagon is tilted up. Another temporary brace, wooden, and connected to what will become the most vertical member of the pentagon, is folded out after tilting, allowing the pentagon to stand by itself. Domes, being gregarious, tend to grow in communities. 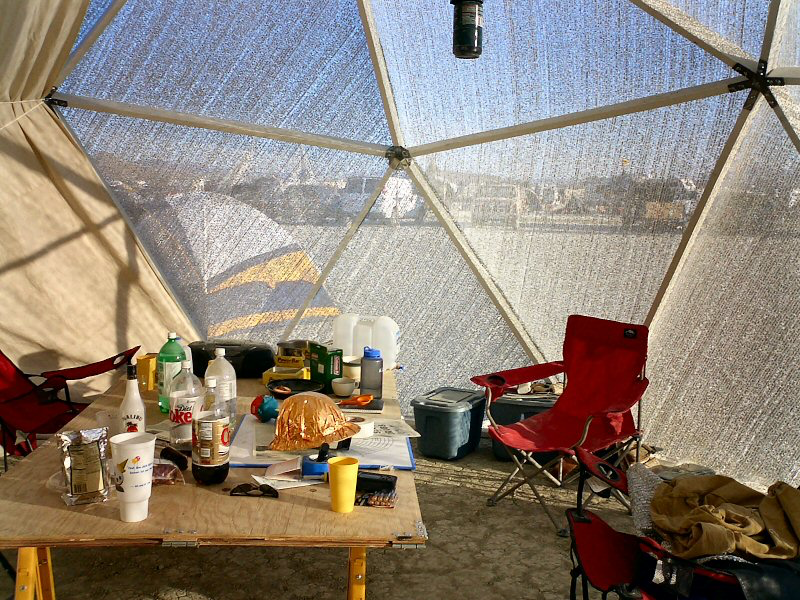 The open-minded domes of Burning Man prefer the stimulation of meeting domes unlike themselves. Here, a classic parachute-covered PVC Van Brink-Lerner Dome communes with the Wooden 2-by-4 dome. The small, triangular shower structure in the foreground likely is their offspring. The outer covering of a dome determines its performance during high winds. In an estimated 30-MPH wind, the fitted Aluminet cover of the Wooden 2-by-4 dome barely is affected, but the parachute cover of the PVC dome is released partially, reducing stress on the PVC structure and preventing collapse. After a nighttime 35-MPH wind storm, the cover of the PVC dome has found a lowest-energy state, hanging below the structure instead of being draped on top. The Wooden 2-by-4 dome has reduced its doorway to a three-foot wide slit on its downwind side. 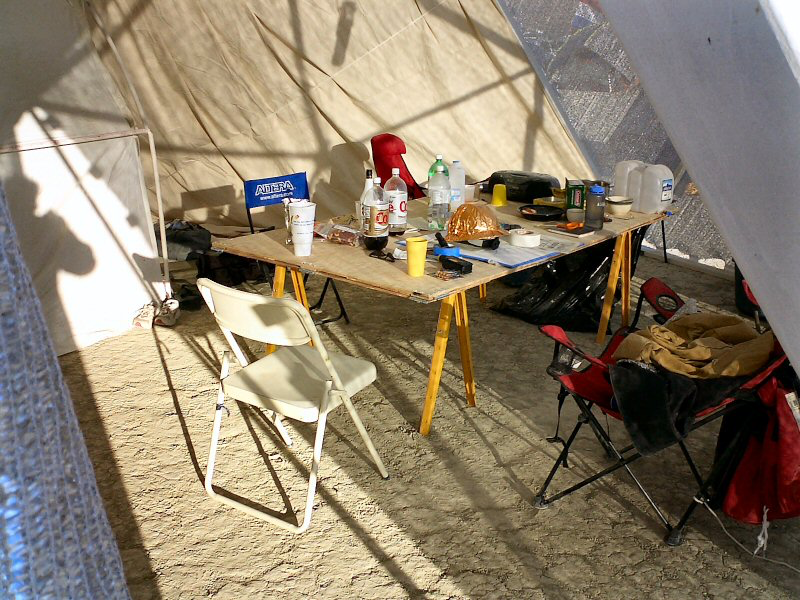 Inside the Wooden 2-by-4 dome are found surprisingly comfortable eating, sleeping, and lounging areas. The purpose of these interior structures likely is to attract maintenance symbionts that reside inside the dome, protected from the high-speed winds outside, while providing any repairs or adjustments beneficial to the dome that outside conditions warrant. 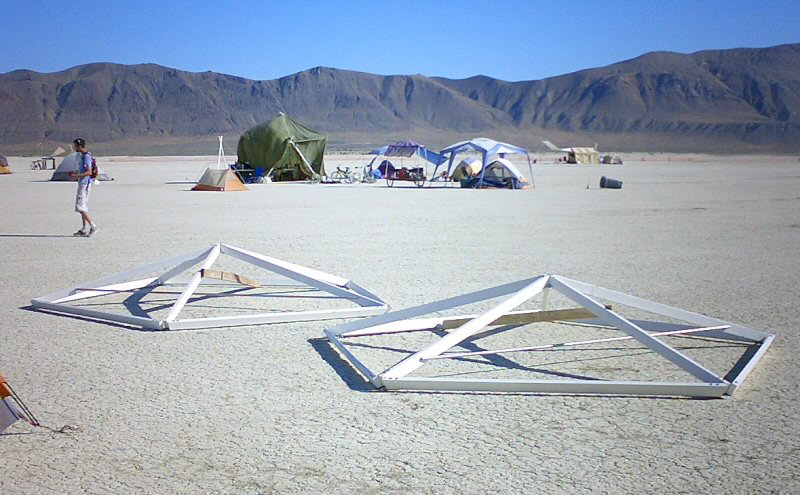 The fitted Aluminet cover of the Wooden 2-by-4 dome allows illumination and ventilation, as well as a view of Black Rock City to the North. Hanging from a zig-zagging rope on the South side of the dome’s frame, a canvas UV shade completely blocks light rays that are dangerous to or uncomfortable to the dome’s symbionts.